I am loving this product we found in a sweet, little shop called Stan Portley’s here in London. It’s usually used as a natural sealer for Van Gogh chalk paints and is made in Canada (in BC). Making progress! A beautifully smooth drywall job is almost finished thanks to the kind and talented Abraham from Abraham’s Drywall. There are some things you can DIY, and trust me, drywall mudding is not one of them! master bedroom before and afters: the big reveal! Before: Although this moody teal is getting it’s share of attention this year, light and bright is the way to go for this urban farm girl. Benjamin Moore’s Simply White OC-117 has been a favourite of mine for years. I have used it in many of my own rooms and recommended it countless times to clients and friends. Closing in this odd ledge area was the first project we tackled, and by we, I of course mean Adam. Once the electrical was disconnected, the space framed and drywalled, we decided to create a true retreat from all electronics and designated this room as a wifi free zone, no phones, tablets, laptops, etc. We used shungite powder in the primer to protect against harmful EMF radiation. I will write more about the benefits and healing properties of crystals in another post. A shout out to our local Benjamin Moore rep who was very accommodating to make the special mix for me – Leila you rock! 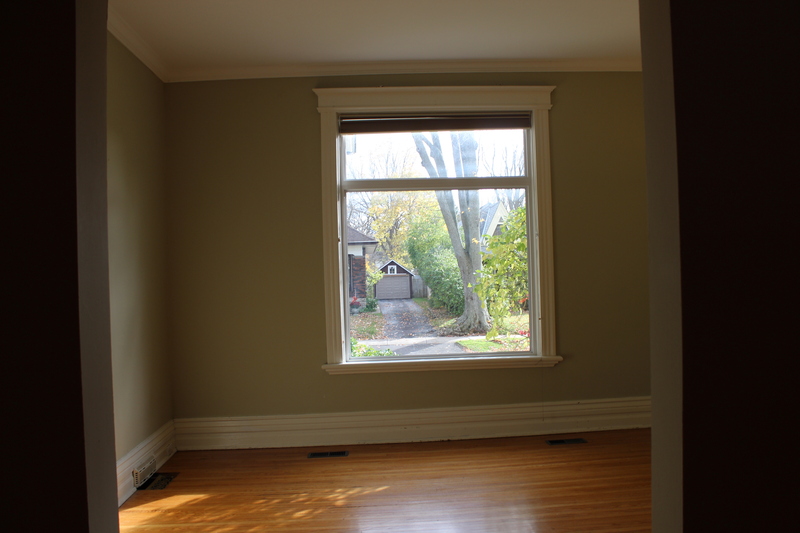 Painting the trim the same colour as the walls provides a unifying backdrop to everything in the space and the lack of contrast actually makes the room appear even larger. 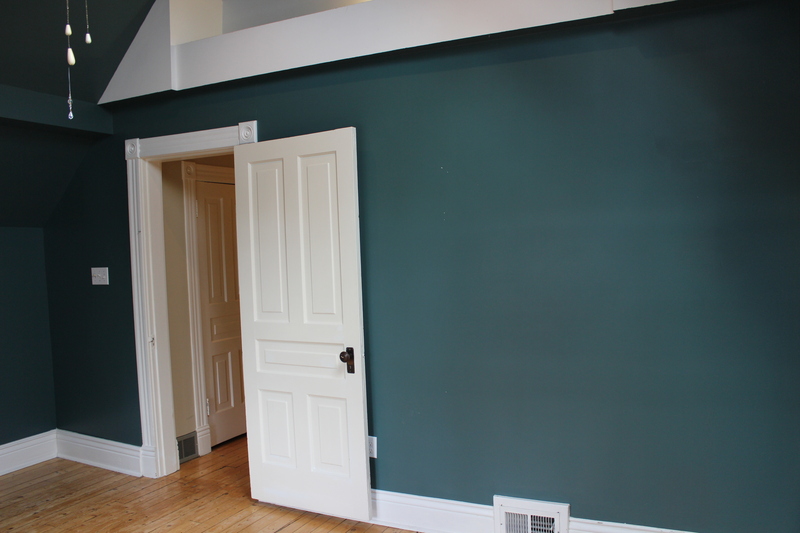 Sheen for the walls: eggshell, sheen for the trim: satin. 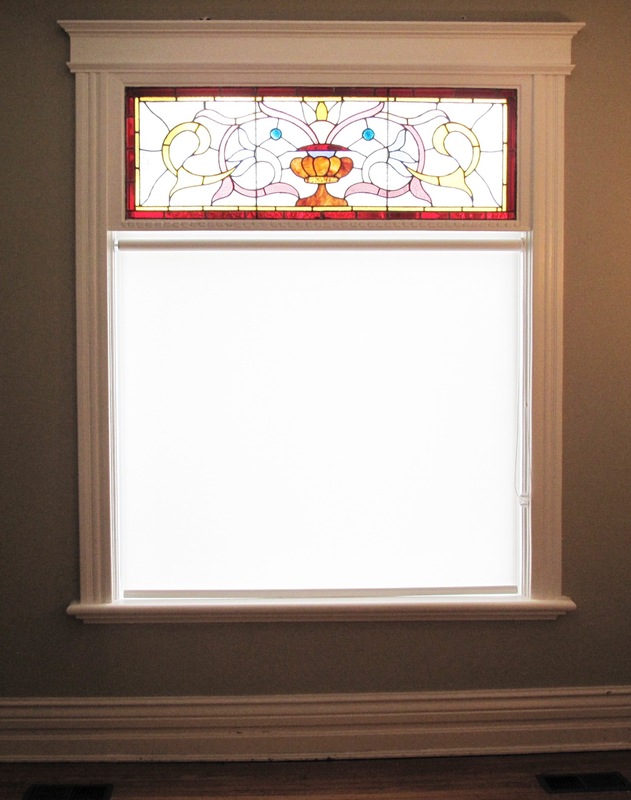 Simple white roller shades from Blinds to Go are just the thing to offer privacy and allow light to filter in. If you aren’t a morning person, be sure to order room darkening shades. 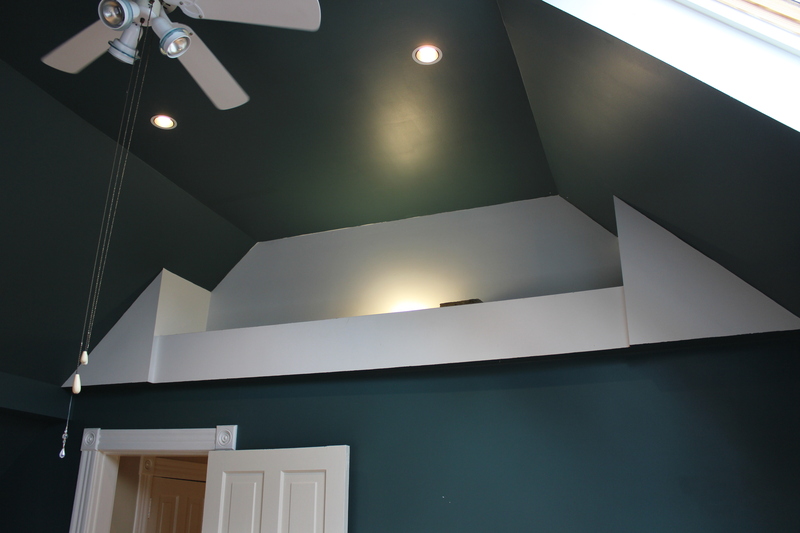 Oh…and that skylight! We are looking forward to waking up in the trees – hurry up spring! Can you guess who gets the double closet? Yup! ME :) The closet was another project-within-a-project. Now, you might be tempted to skip painting and fixing up the inside of your closet but I will tell you now, take the time to do it when you paint the room or you will NEVER get back to it. And it is soooo worth the effort. We found a weird vent situation that Adam remedied with a new duct, drywall and a wood ledge. He also made shoe shelves that span the width of the closet. We rehung the original wire shelving but added wood trim to finish it off. So happy with the results. You can see the floors are the original pine sub-floors and here, my friends, is where Adam and I have a serious parting of the ways. I want to keep and restore them. Adam wants to install new floors. He is trying to woo me to his side with the promise of white oak laid in a herringbone pattern…yes, he knows which design buttons to push! What do you think? The white walls became a blank canvas for displaying art, crafts and treasures. 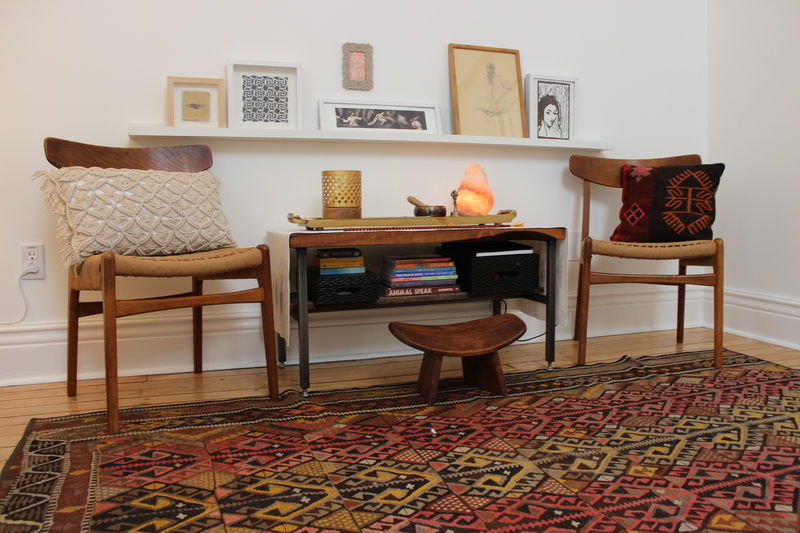 The ‘angel wings’ were an auction find, the vintage lamp was my grandmother’s, the carpet is an antique kilim we bought from a collector. I’m in LOVE with this rug! 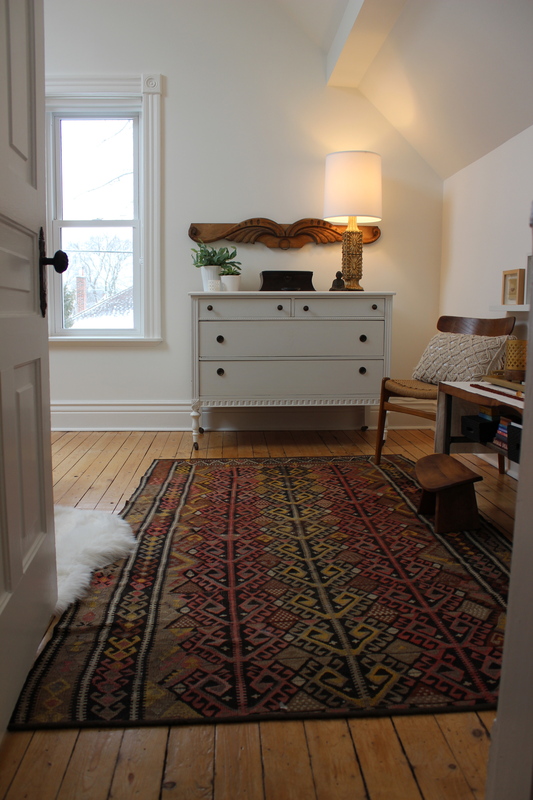 The vintage dresser is another auction find that we brought with us from our old house in Toronto. The jewelery box was a gift from past work colleagues. It is the collecting of things over time, the mixing of new and old that make a space interesting and truly unique. This little area is a great place to display artwork and where I do my morning yoga and meditation. The artwork is a mix of prints from an OCAD grad show, photographs, fibre art and a sketch from a life drawing class (please stop asking, I drew her, I wasn’t posing.) We love these original Hans Wegner chairs we scored from the Gardner Galleries auction, they will most likely move to my office once that room is finished as they are as comfortable as they are stylish. The bedsid e lights are also from our old home, originally purchased at IKEA. We replaced the bulbs with dimmable LED’s and added a dimmer switch. 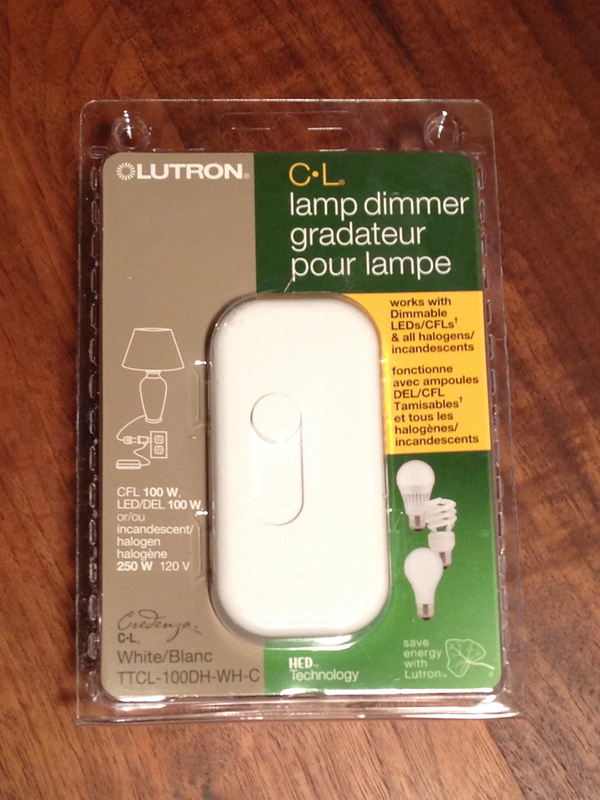 Yes, a dimmer switch for lamps! Ah-mazing, and works with all types of bulbs. Love this product! And BTW, LED’s are everything compact fluorescents aren’t. They cast a truly warm light (be sure to check the packaging), last forever (ok, like 22 years) and contain no mercury. 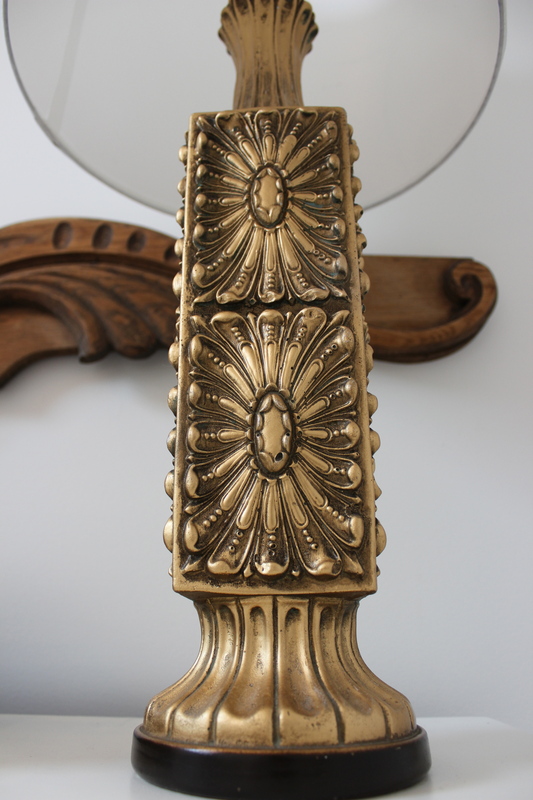 This lamp is one of a pair that I inherited from my grandmother. I absolutely adore them! All they needed was a taller harp and a new shade. LOVE! When style meets sentiment, it’s magic. Tip: when looking for a shade, bring your lamp to the store and try a few on! Harp and shade are from Living Lighting. Sometimes you must see beyond an item’s original purpose. The woven wall hanging to the right of the bed is actually a table runner! The stools, now used as side tables, were headed for the trash. Adam rescued them, along with some barn board he found curbside, to create these stunning and functional bedside tables. The little woven bowl I made at the Craft Bee! When I fall in love with a fabric, I buy a yard or two. Even if I don’t know what I’ll do with it. I picked up this gorgeous print in NYC almost 10 years ago and made it into the perfect pillow for the bed. The runner on the bench breaks up the wood and is one of my own screen printed designs. The snuggly little fellow, who stayed for the entire photo shoot…our little Leo. Photo credits: Thanks to the lovely and talented, Elaine Andrews! Adam and Shane framing the bathroom! Has this ever happened to you? The tub is ready for pick up, the lighting has arrived, the faucets will be in next week, the new toilet is sitting in the dining room – all the design elements are on their way and WHAM! you decide to completely change the plan. I MEAN COMPLETELY! And you know what? I love this design even more than the last! Luckily, all of the purchased (and handmade) elements will fit in the new design (plus an additional vanity).